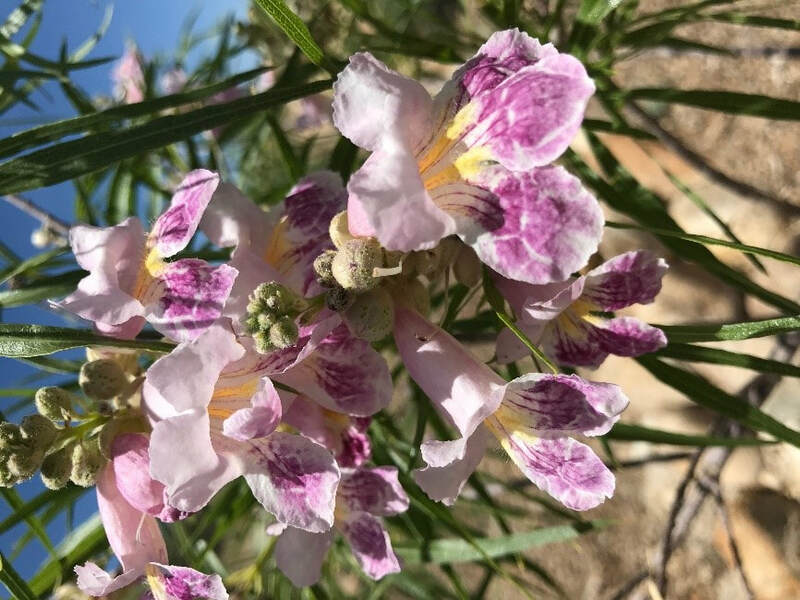 Desert willow can found as either a large shrub or tree up to 30 feet tall. It is most commonly found in dry washes and upper terraces of flood plains throughout the desert southwest. Flower color can range from white, pink, lavender and purple or any combination of the various colors. Chuparosa means "hummingbird" in Spanish. It is a small to medium sized shrub up to 6 feet tall. Found in areas with loose, dry soil in washes and canyons. Native to desert regions of southern Arizona and adjacent California. Flower color can range from red to orange to yellow. The flowers of fairy duster are a puff-ball of stamens that range in color from white to pink to red which show up in the Spring but can also re-bloom again in the Fall. This is a relatively low shrub growing less than 3 feet tall. It grows in washes as well as slopes and on top of mesas throughout the desert southwest. Hummingbird trumpet grows as a sub-shrub less than 2 feet tall. Sometimes they are confused with Penstemons but this species blooms from Summer into the Fall while Penstemon blooms mainly in the Spring. It is found from California to New Mexico in a variety of dry to moist soils. Penstemons are short lived perennials. Flower colors on various species can range from pink to red to purple and generally seen in the spring. When in bloom the flower stalks can range from 24 inches to over 36 inches tall. Some species can lose most of their above ground foliage during the hottest and driest times of the year but return in the Fall and Winter. Penstemons are found throughout the intermountain west. Scarlet hedgenettle is a perennial herb growing to appproximately 36 inches tall. It prefers moist locations around washes and streams. With enough moisture it can bloom continuously from January to November. Its native habitat is from Arizona to West Texas. Despite the common name "century plant" most species of Agave bloom between 10 to 25 years of age. The flower stalks can reach 12 feet to 18 feet in height and when finished the rosette that the stalk came from will die but offsets will continue to grow. 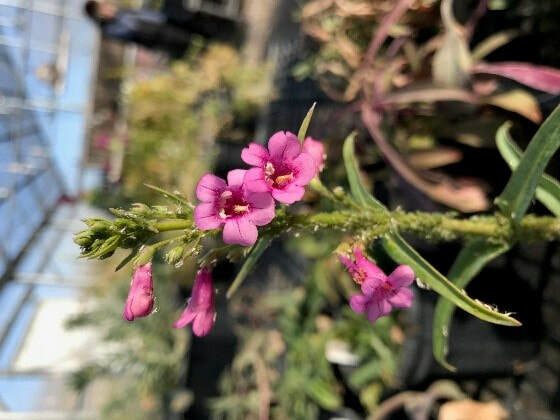 This species likes well draining, rocky soil and occurs in Arizona and New Mexico.